The smart choice in coatings and waterproofing! Protective Coatings & Waterproofing Inc. 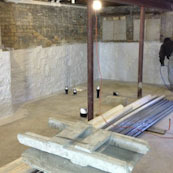 When a contractor or a homeowner expects a watertight structure then a waterproofing system must be used. 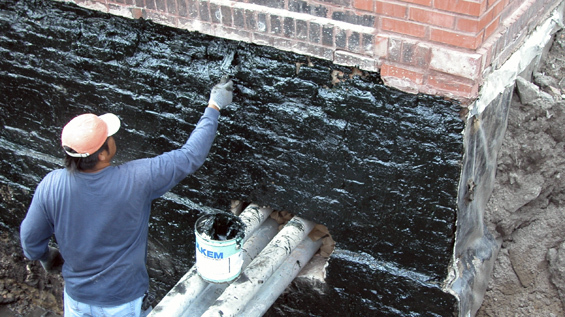 A true waterproofing coating is designed to stop water infiltration. 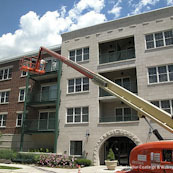 Protective Coatings & Waterproofing, Inc. specializes in Rubberized Polymer Technology which allows the wet sprayed applied coating to literally meld into a flexible rubber membrane, creating a water barrier that retains its elastomeric (rubberized) properties keeping a lower level living space dry and fresh for many, many years. We are proud Certified Applicators for all TK-HydroMax product lines. 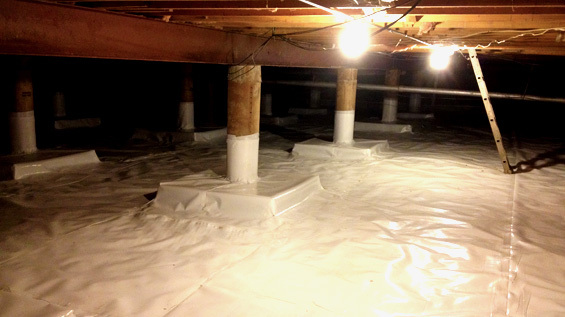 A drainage mat play’s an important roll in a complete foundation waterproofing system. A drainage mat is specially developed to provide a simple and highly practical collector and deflector of unwanted ground water from foundation walls, retaining walls, tunnels and planters. 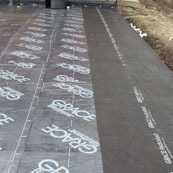 When installed with a waterproofing membrane it protects the membrane from damage and minimizes the hydrostatic pressure build-up of surface water against the structure. Below-grade insulation is a great choice for value-conscious builders with R-value requirements for lower living spaces. Protective Coatings & Waterproofing, Inc. continues to seek for “green” product lines that are energy-efficient and environmentally sustainable. ThermalStar® Rigid Foam Insulation is made from 100% recycled and recovered resin. Contains no CFCs, HCFCs or VOCs, and is free of hazardous outgassing agents. 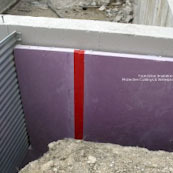 Self-adhesive rubberized sheet membranes are ideal solutions for foundation walls, tunnels, earth shelters structures and split slab construction, both above and below-grade. Made from rubberized asphalt and a cross laminated polyethylene film, this combination provides dimensional stability (controlled thickness), high tear strength, puncture and impact resistance. A Bentonite Geotextile System is a highly effective waterproofing composite, consisting of high strength geotextiles and sodium bentonite; together they form an extremely strong monolithic waterproofing membrane. 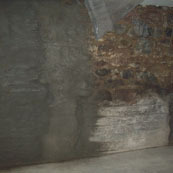 The high swelling, low permeable sodium bentonite works by forming a low permeability membrane upon contact with water. They contain zero VOC’s, can be installed in almost any weather condition and most importantly has proven effective on both new and remedial waterproofing projects worldwide. A moisture remediation coating is a highly specialized two (2) component, 100% epoxy formulation designed to reduce moisture vapor created in either green or old concrete. 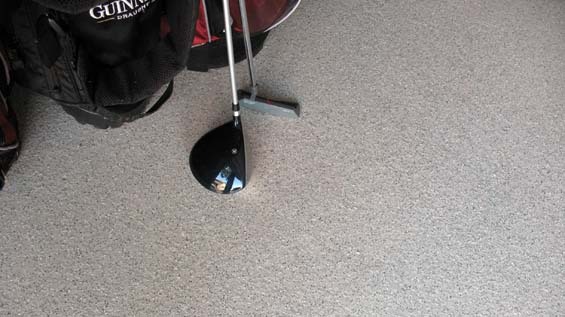 These specially formulated coatings can reduce a moisture vapor emission rate of 24 pounds down to approximately 3 pounds as per the Calcium Chloride Test. They are low odor, solvent free, V.O.C. compliant. 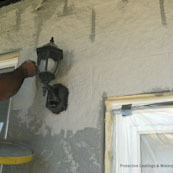 Can be used as a stand alone sealer or “curing” primer for concrete. 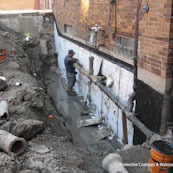 Property and homeowners need to consider an inspection of any below-grade or basement wall before starting a remodeling project to help prevent damaging water from entering the basement. 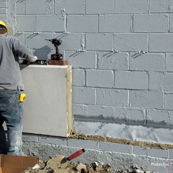 Sealing a below-grade wall or basement wall from the inside with a waterproofing product requires that the product must be able to withstand "negative hydrostatic pressure". Negative hydrostatic pressure is water pressure that passes through the substrate or wall and presses on the back side of the coating. Constant hydrostatic pressure is more than enough to eventually push many types of coatings and paints off the interior of below-grade walls. There has been remarkable developments in the coating industry from environmentally safe, liquid applied, hybrid polyurethane coatings to deep penetrating Densifier sealers to help keep a newly remodeled basement comfortable and dry. The Xypex crystalline system for concrete waterproofing is substantially different from traditional barrier products like membranes and cementitious coatings. Xypex creates a crystalline structure deep within the pores and capillary tracts of the concrete mass to prevent the penetration of water and aggressive chemicals. 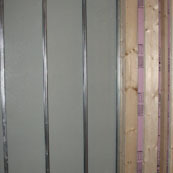 In contrast, barrier-type products function only at the surface of the concrete. Because Xypex is not dependent on surface adhesion to achieve its waterproofing effect, it is resistant to extreme hydrostatic pressure. It will seal hairline cracks up to 0.4 mm. It is not subject to the deterioration problems encountered by membranes. Xypex is permanent and reactivates whenever water is present. An air barrier system is a system of building assemblies within the building enclosure—designed, installed and integrated in such a manner as to stop the uncontrolled flow of air and moisture into and out of the building enclosure. 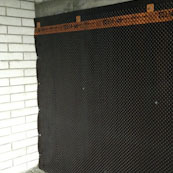 Moisture laden air leaking in from either the inside or the outside is barred from entering the building enclosure. If this is not done this moisture laden air can migrate far enough into the building assembly that they can be cooled down to their dew point and at this point the water vapor turns to liquid water. This liquid water can corrode metals in the building assembly, provides one of the ingredients needed for mold growth, saturate building materials such as fibrous insulations, drywall, and wood. Air leakage has the ability to transport exponentially more moisture into and through the building enclosure than occurs through vapor diffusion alone. Anti-graffiti coatings can be invisible to the naked eye making them ideal for protecting buildings. There are two different categories of anti-graffiti coatings. 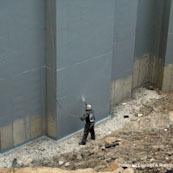 The first, sacrificial coatings are applied to a surface and then removed when graffiti is applied. The surface underneath will be left clean and a new sacrificial coating can be applied. The other types of coating are permanent coatings that prevent graffiti from adhering to a surface in the first place. 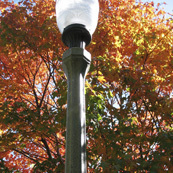 An Anti-Graffiti coating installed on a City of Chicago Park District concrete light pole. Penetrating Water Repellents can be classified into five groups: siloxanes, silanes, silicates, methyl siliconates, and various blends of these. Penetrating water repellents enter the pores of the masonry substrate and deposit their water repellent component on the walls of the pores. Film Forming Sealants frequently contain acrylics, mineral waxes (paraffin), urethanes, and silicone resins. 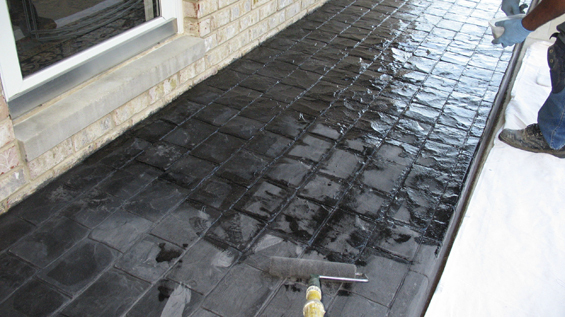 Film-formers deposit their water repellent components on the surface or top of the masonry substrate. 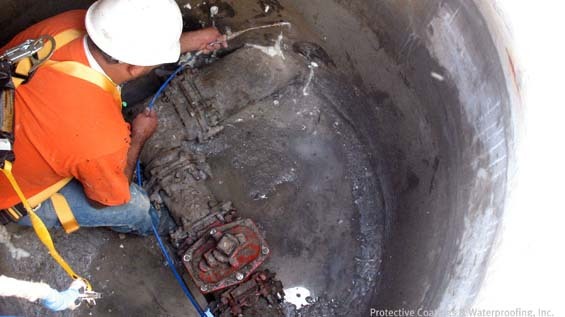 Protective Coatings & Waterproofing, Inc. recommends a Tri-Siloxane which is a water-based, low viscosity oligomeric organosiloxane, deep penetrating, invisible, non-darkening water repellent for concrete and masonry. These siloxane groups chemically bond, not just physically bond to the masonry substrate. It helps to prevent spalling, freeze/thaw damage, and rebar corrosion. It penetrates up to 1/4 inch and becomes a permanent part of the substrate not allowing water to enter, but allows moisture vapor to pass out of the substrate. Acrylic coatings are used for protecting prepared vertical concrete, stucco, EIFS, masonry, or previously acrylic-coated smooth/textured surfaces. These coatings bring a wealth of protective characteristics and aesthetic options to a building design, extending the lifetime of a structure’s appearance and protecting it from the elements. Most acrylic coatings are safe to apply, environmentally friendly have elastomeric properties which can cover hairline cracks. They resist wind-driven rain and offer superior UV resistance and deter growth of mold and mildew on vertical surfaces. 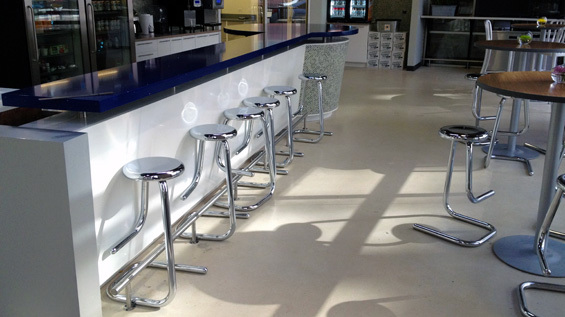 Acrylic coatings are available in a variety of colors and textures to provide the greatest design options.